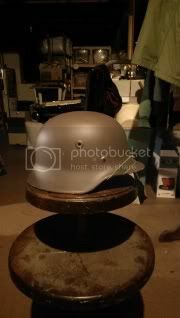 Post subject: M40/55 Finnish contract stahlhelms from IMA-USA.. Alright..I'll probably get flak for this. 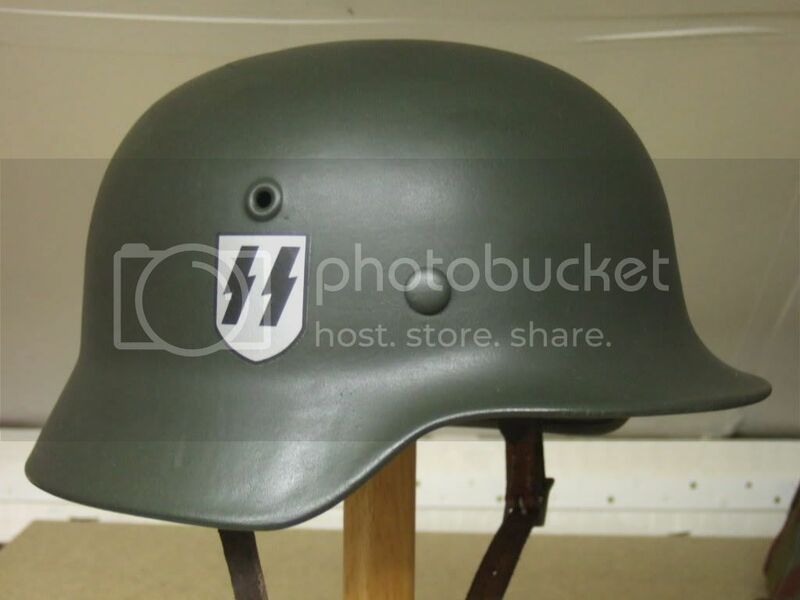 But..for those on a budget,IMA-USA has the last stocks of M40/55 Finnish contract helmets. I got mine for 89 bucks. They were stamped on the same machines by the same wartime manufacturer. Hitler sent a lot of these to Finland when Russia was trying to overtake their country. The u.s. and Britain were short on materiel to begin with so Finland reluctantly turned to Germany. Some of these helmets are those helmets. 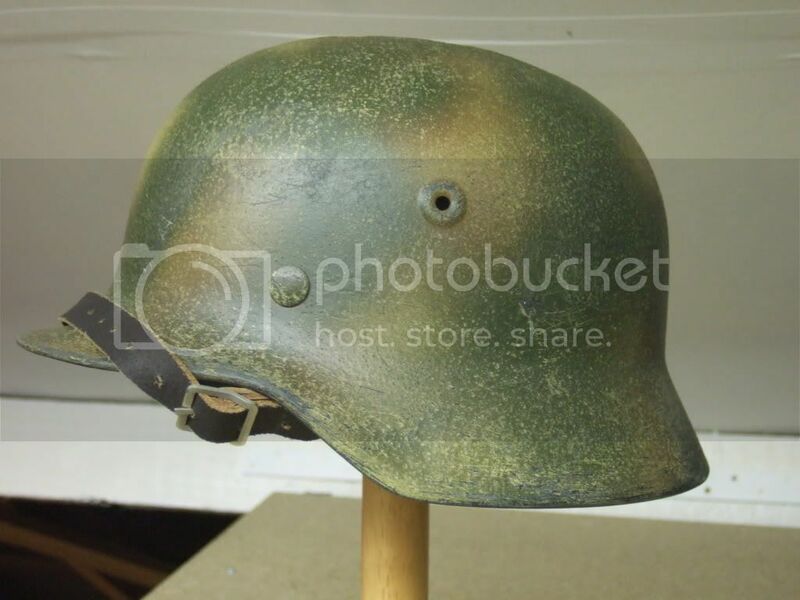 Post war West Germany received another contract in 1955 for the M40 helmets. 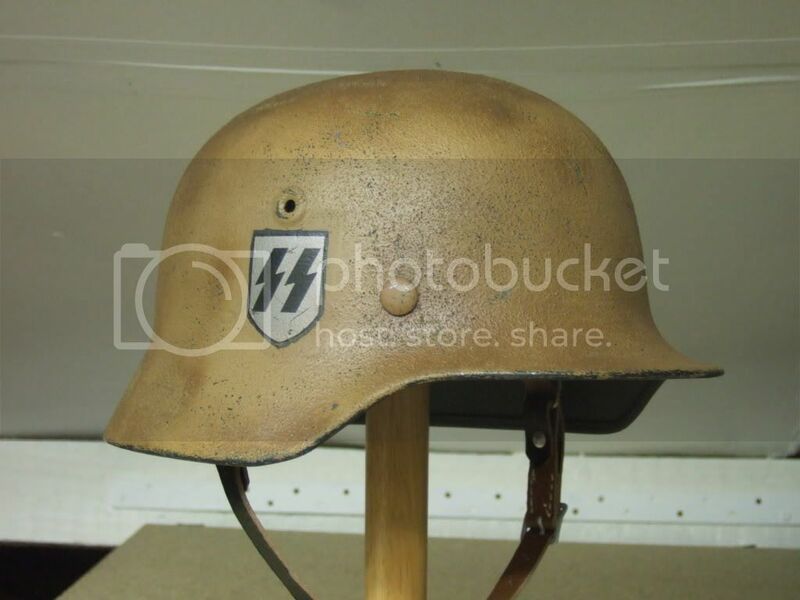 IMA thinks that at least some of these helmets are sterilized wartime helmets,with the markings removed. (was illegal for West Germany to profit off of WWII surplus)I couldn't tell you which mine is. There are no markings. The shells are M40's. The liners however are Finnish. The liners are garb. Fiberglass or plastic,with the normal rawhide and string. 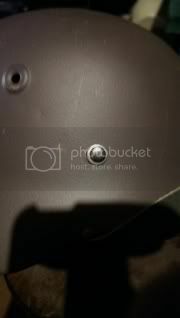 Where the German split pins should be are the Finnish ones with a washer. And on the inside,are rubber washers to accommodate their liners. 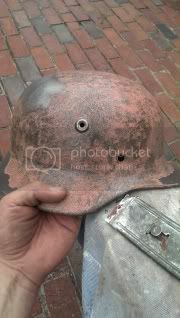 Fortunately IMA has a lot of helmets that the shells werent drilled,and the original split pin holes were used. Some shells were drilled however. I paid an extra $10 for hand picked and specified a shell that wasn't drilled,and received it. All this shell needs is a repro liner and split pin set. (and a good paint job and water transfer decals. 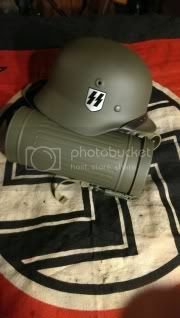 )it's a great Chance for a M40 helmet made by Germany. Not repro crap. Here are some photos .. Very good price! Any markings on it? Unfortunately no. So I believe mine was from the 55' contract. IMA says they have some that they believe were "sterilised,I.E. 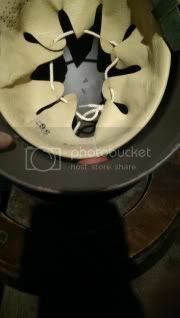 markings removed from war time helmets,and original paint stripped so they could legally be sold post war. 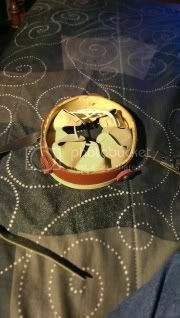 For me to get a refurbished original it would cost me $340.00usd. 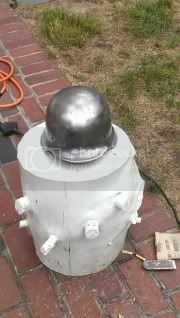 All told when I finish this helmet with a repro liner and split pins,paint and decals it'll have cost $137.00. Still a great deal. 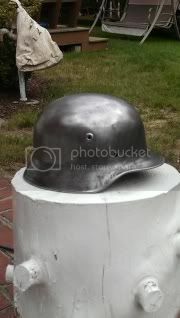 I'd rather beat on this helmet reenacting than a wartime M40. I should add,a lot of these helmets were used by Finland upuntil 1977..so the liners were replaced I imagine at least a couple times. on the way. This is the type of B.S. you can expect to find in a M40/55. Those post-war Finnish M55 shells are very good actually - I picked up three of those over here in the UK a few years back and did them up, put in M31 liners etc. They are much better than repros, but there are a couple of very minor differences between the M55 shells and the original M40 shells - below are pictures of one of my M55s and one on my original (but restored) M40s for comparison - the differences are that the embossed edge around the air vent is "fatter" on the M55 than on the M40, and the front two holes for the liner retaining rivets/split pins are placed a bit lower on the M55 than on the original M40 (meaning that when you put an M31 liner in an M55, it hangs a bit lower at the front of the M55 shell than it would in an M40, but not a major issue). But apart from those very minor (barely noticeable) differences, they are definitely the next best thing to an original shell. Wow,your 55' came out fantastic..as is the original..I'm glad you posted,I did not know about these slight diffrences,but looking at the pics I can see what you mean about the airvents..the two front split pins on the two,you really need to look to see the diffrence..I made another post about correct Stampings ect. and asked for opinions..and one opinion is that it's unfair to collectors to do this should it ever leave my possession it could be passed off as a genuine wartime helmet,but these diffrences would certainly distinguish it from an original. I guess the stamps really don't matter. I'm content to not go through the hassle anyway. I am really looking forward to building my 55'. My idea is a single SS decal, feld dunkel paint,a coat of whitewash,and another feld dunkel paint coat,beating that up a bit so the layers show,and finally woodchip camo with a feld grau or maybey apfel grüne color,with that scuffed up a bit so the decal shows a bit. Unfortunately,the Finn's used a pink primer under the normal paint,so I'm going to have to strip this..did you find this primer on your 55's? Like you say, I wouldn't bother with the stamps (I haven't with mine). Mine came the same greyish colour as yours seems to be, but fortunately didn't have the pink primer..! No worries - paint stripper should sort you our fairly easily with the pink primer, it is worth putting the effort in as, like you say, you don't want pink scratches..! Looking forward to seeing it completed - have fun...! I'll post as I go. Got the stuff coming from 3 places. The M31 liner is from IMA-USA,the split pins and decals from At the front(IMA's split pins have an odd raised rim around the edge and look off so I avoided it) and the paint I ordered from 1944 Militaria. (M40 feld dunkel) This is the part in my collecting kit I've been looking forward to. Good grief. Be glad you didn't have that pink primer! The grey paint over it was so thick I had to use a razor to get it off..the primer was a bit easier,for that I used 150 grit sand paper and a mouse sander..stripped and ready for paint. Paint,splitpins decals and liner arrive tommorow. Liked the look of this when I finnished painting it I decided to leave it as is and let it get banged up naturally at events. Nice one mate - looking good..! Thank you,and thank you for your help! Your post on paints and colors will be helpful in the future when I do field modifications to this helmet. The only thing left to do to this one is paint a white patch on the front,and a red cross because I'm portraying a Sanitätor. No worries mate - you'll get the bug now and before you know it you'll have 30+ German helmets sat on the side like me...! 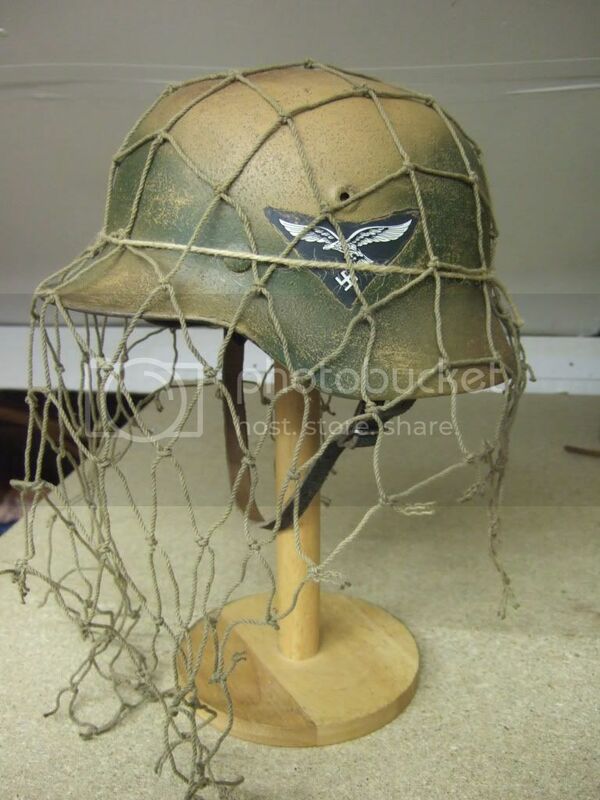 Re your Sani helmet, just bear in mind if you're doing Russian Front (not sure if you are?) Sani's avoided displaying the red crosses etc when facing the Soviets, so in which case your lid is just right as it it....!